The earliest recorded form of tennis played in in Thornbury was what we now call ‘real tennis’. This early form of tennis was played in an enclosed court with a net dividing the court into two ends. Around three sides of the court there was a lean-to with a sloping roof called the Penthouse and there were various openings which were used as targets. The ball could be hit against any wall and remain in play until one hit hit the ball against the net, out of the court or hit a target. The real tennis court was located in the grounds of Thornbury Castle between the outer and inner walls in the vicinity of the Pithay. We have various references to the room being called ‘The Tennis Court’ in the late 1800s when the room became a meeting room much used by Thornburians, at least until the Cossham Hall was opened. 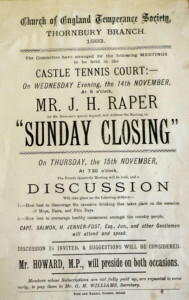 Here we show a photograph of an exhibition held in the Tennis Court in 1885 and an announcement about the use of the Tennis Court for a meeting. Click on the thumbnail to see a larger image. The only reference we have found so far to tennis being played in the Castle is amongst the notes made by Edgar Mervyn Grace who was born in 1886. Edgar said that he enjoyed tennis, although admitted that he had to use two hands on his backhand strokes which was not approved of at that time. He reached the final of a Freshman’s Tournament in Cambridge University but lost because ‘using both hands was practically forbidden’. He enjoyed a great deal of tennis on his court at Park House and he played a few games on the indoor court at Thornbury Castle after the First World War. Traces of the room can still be seen, although the access is very hazardous. In 2010 some members of the Thornbury Museum Research Group obtained permission from the then owner to search for the tennis court. They bravely hacked through the undergrowth and found the court which was clearly identifiable with a photo showing an exhibition in the Tennis Court in 1895. It is interesting to note that the room appears to have been lit by gas lights still visible and set into the surrounding walls. Tennis in the modern sense was referred to as ‘outdoor tennis’ or ‘lawn tennis’ from as early as 1793. However it was not until the 1870s that the rules were drawn up and what is now the accepted layout of a tennis court established. Tennis soon became popular in the older universities and one of the first Lawn Tennis clubs in the world was established in Cambridge in 1881, seven years before the Lawn Tennis Association. It is not surprising that at least some of the young men who played tennis in Thornbury in the late nineteenth century had played at university. This included members of the Grace family such as Edgar Mervyn Grace who was a student of Christchurch Cambridge. Tennis became very much a social occasion and it was one of the few sports that young ladies could take part in and meet suitable young men. Several of the larger houses in Thornbury had their own grass courts and they arranged tennis parties that were very popular with the younger people. These houses included Park House in the High Street, Stokefield House, Thornbury House and the vicarage in Castle Street and Shen in Gloucester Road. Tennis was also played in Thornbury Grammar School from at least 1925 onwards. We are not sure where the tennis courts were at that time. Diana and Mollie Cotter attended Thornbury Grammar School from March 1925 and found it a great culture shock. The school was co-educational but the girls were reminded that any contact with boys could only take place on the tennis court or cricket pitch and even then only with with parental or at least adult supervision. Matches regularly took place against other grammar schools and against The Old Thornburians. The school magazine notes that in 1936 two new grass courts were provided in the Chantry field for the girls. The hard tennis courts were laid in the old quarry in 1938. 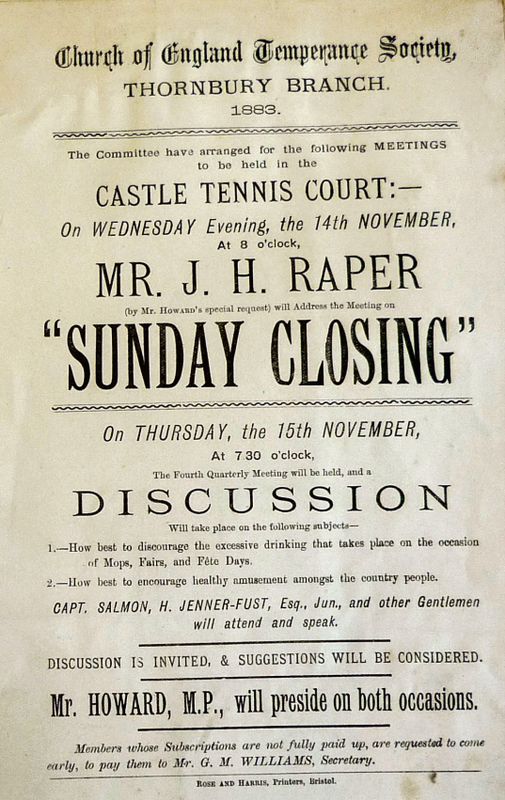 In view of the great popularity of the game it is not a surprise to learn that a tennis club was formed in Thornbury – presumably so that those who did not have their own courts could play the sport too. The Thornbury Tennis Club was formed about 1911. The Officers were Mr Cresswell, Chairman, G. B. Symes, Captain, A. E. Pitcher, Vice Captain, Miss Exell, treasurer and Miss Cooper, secretary. The 1916 Prewetts Directory shows W. W. Councell was now the Chairman and Captain, E. Timbrell was Vice Captain and Misses Exell and Cooper continued in their roles. The Club’s courts were built on land owned by the Harwood family and had been part of the land of the nearby Lower Marlwood Farm. These were located at the bottom of the field now known as The Mundy Playing fields (which didn’t exist at the time) and where the tennis club still has its courts. The photograph at the top of the page was taken about 1920. We have been told the photo includes Rose Symes, Frances Trayhurn, Miss Davies, Elsie Ball, Miss Cooper (whom we assume to be Mabel Cooper) and Mabel Trayhurn, but we are unable to identify individual people. One of the early members was Annie Maria Pitcher, the daughter of Walter William Pitcher. She died in 1923 aged 52 so must have been in her 40s when playing. Another early member was Marjorie Savery who was born in 1899 and died in 1925 shortly after marrying Reginald Phelps in 1924. The bearers at her funeral were four members of the Tennis Club: W. Rabley, D. Cullimore, H. Fudge and H. Warren. The Western Daily Press dated 30th July 1925 reported that R. S. Palmer (who we assume to Robert Spencer Palmer) represented Thornbury in the inter-club men’s singles tournament at the West of England Championship at Redland Green. He lost 6-2, 6-1. In the inter-club ladies singles, Thornbury was represented by ‘Miss M. Wilkins’ (who we assume to be Mildred Laura Wilkins). She lost 6-1, 6-3. In 1931 William G. Rabley was secretary, by 1935 Miss D. M. Wooley had taken over and by 1939 Miss J. Bruton was the Secretary. 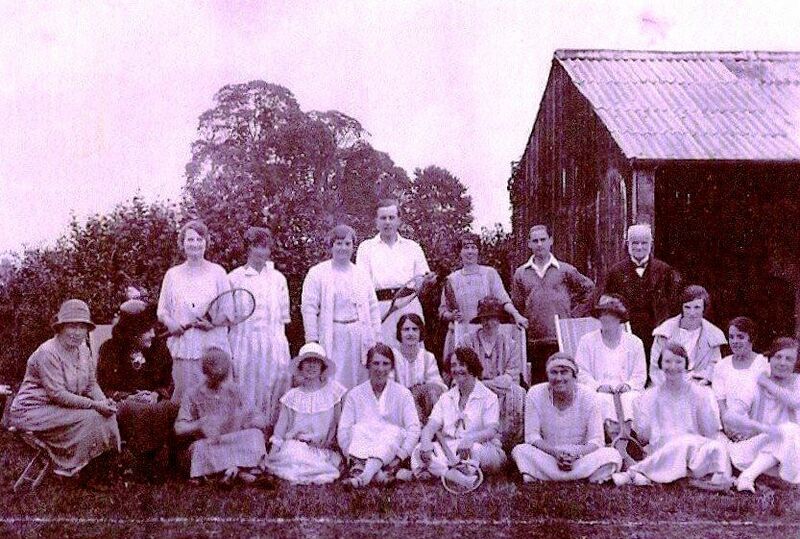 The town’s tennis club continued at the Lower Marlwood site, paying the rent to the Harwood family until 1947. Then Dr Basil Harwood conveyed the site occupied by the tennis and bowling clubs to Thornbury Parish Council, as a memorial to his father, Edward Harwood who had been a well known banker in the Town. When the bowls club ceased and its members moved away in 1958, the tennis club took over their site and expanded the number of pitches.